Offering you a complete choice of products which include rigid empty scroll boxes in white for wedding stationers, empty boxes for scroll invitations, empty scroll boxes and empty scroll boxes suitable for wedding invitation. Hard, rigid scroll boxes for wedding invitation designers. 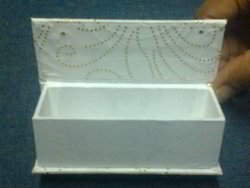 EMPTy scroll Boxes in Ivory, White and can also be made in custom color.s. Metallic Embossed Handmade Paper Scroll Boxes with dew print Inner Papers. Dew Printed Handmade Paper Scroll Boxes available in various sizes. Empty Scroll Boxes available in a wide variety of Colors. Foil Printed Boxes for Packaging Scroll invites .We Manufacture and Supply Empty Boxes for Scroll Invites. We Ar e supplying Empty Scroll Boxes in Hard and Folding Varieties. Our Scroll Boxes can be logo printed as per your specifications. Dew Printed Handmade Paper Scroll Boxes available in various sizes. Empty Scroll Boxes available in a wide variety of Colors. Foil Printed Boxes for Packaging Scroll invites .We Manufacture and Supply Empty Boxes for Scroll Invites. We Ar e supplying Empty Scroll Boxes in Hard and Folding Varieties. Our Scroll Boxes can be logo printed as per your specifications. 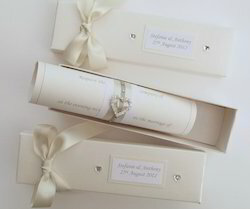 We Manufacture and Supply Empty Boxes for Scroll Invites. We Ar e supplying Empty Scroll Boxes in Hard and Folding Varieties. Our Scroll Boxes can be logo printed as per your specifications. Empty Scroll Boxes available in a wide variety of Colors. Foil Printed Boxes for Packaging Scroll invites. We Manufacture and Supply Empty Boxes for Scroll Invites. 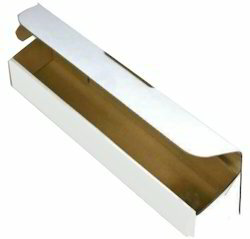 We Ar e supplying Empty Scroll Boxes in Hard and Folding Varieties. Our Scroll Boxes can be logo printed as per your specifications. Looking for Empty Wedding Scroll Boxes ?